Those who are familiar with the basics of feng shui are aware that flooring makes a big difference. After all, the purpose of feng shui is to create an environment that’s practical and well-constructed while still staying calm and inviting. Naturally, flooring plays a big role in accomplishing this in our homes and offices. It’s the foundation of our homes, and therefore, the foundation of the feng shui that we’re building in our homes. In addition to creating positive energy in your interior décor, feng shui can also provide helpful design and layout tips for those who are looking to maximize their space. Feng shui is an ancient Chinese science and art that relates physical arrangements of a home or building and the flow of energy (also called chi). Feng shui is based on certain ideas and principles that are aimed at harmonizing us with our environment. Simply put: following rules of feng shui can make for a happier, calmer environment in our homes or businesses. Of course, it’s important to find flooring that suits your lifestyle and caters to your personal preferences. (What good is perfect feng shui if you hate how it looks?) So keep in mind important considerations like wear-and-tear if you’re working on an office space or a home with children skittering around all day and night. In general, making sure you achieve feng shui shouldn’t interfere with personal preferences and how you want the final product to look. Flooring is literally and figuratively the foundation upon which your home is built. In the feng shui philosophy, the floor is associated with the earth element. This means that colors are best suited to calm, earthy colors like browns, tans, greens, and warm grays. For those with wood flooring, this should be easy, as the main consideration is making sure the color of the wood goes well with the furnishings and other elements of the décor. Then, you can complement these earthy tones of your flooring with green tones in the rest of your interior design elements. Plants do a great job of complementing your wood flooring and providing good feng shui. In feng shui, shapes are an important aspect of the design process. 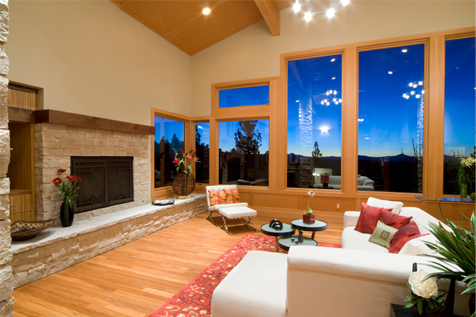 Shapes and layouts are said to strengthen the flow of energy through the home. Likewise, spaces that poorly utilize shapes and layouts are said to block energy flow and create stagnant areas, both in the home and in the home’s energy. According to feng shui, the way you lay the boards will dictate the direction of energy flow. In a narrow hallway, the boards should be placed along the length and not along the width. Even if you’re not set on achieving a feng shui, an interior designer will also tell you that laying boards across the width is a poorer choice – it makes the hallway appear shorter and more closed-in. However, if the hallway leads to a door or window, you’d want to do the opposite – lay the boards along the width of the hallway. This keeps the direction of the boards from simply leading the chi out of your home through the door or window before it can nourish your rooms. If you’re in need of feng-shui-friendly flooring for your Longwood flooring project, call us at (407) 262-7979.